May I set up my booth anyway I want? Island Booths have more freedom, but Inline and Corner booths must comply with Display Guidelines. Items 4-8 feet tall MUST be placed in the back half of the booth. 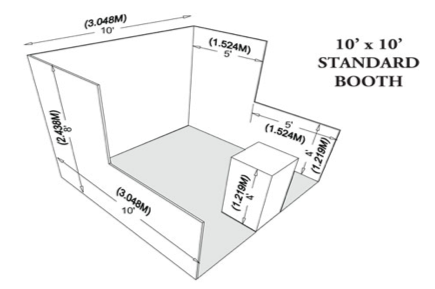 For Corner booths, this means five feet from the numbered aisle (not the cross aisle). What are Exclusive Hours in the Exhibit Hall? Times when there aren’t any competing sessions – a great time for Attendees to visit the hall. Can I have a tote bag? Not at sign in, but check back on Sunday afternoon to see if there are any left. Can I pick up my colleague’s badge? Yes, but please know that if you do NOT connect with them and they come to pick up their badge, we will charge a reprint fee. Why aren't we listed in the program guide? You signed up after the program book pull, which was in late January. All companies are in the Online Listing and on the Mobile App. Can I attend General Session? Any sessions? Yes, your Exhibitor Badge gives you access to ALL the sessions. You may even pay to attend luncheons if there is still room. One person must remain in the booth during Exhibit Hall hours. Will I have a chance to sign up for next year? Yes, we will conduct Pre-Selection all day Sunday in the Exhibitor Lounge. You can ask for your appointment time at Exhibitor Registration or in the Exhibitor Lounge. Do you provide free food/drink to exhibitors? We will have food and drink at various times in the Exhibitor Lounge. There is always a water cooler. Does NSBA let exhibitors present? Yes, the proposal process begins in mid-April and ends on June 1 each year. Speaking of presenting . . . will I automatically get a list of folks that attended my session? No. The temps that are scanning badges are doing it for the attendees so they can get their CEUs. This list will NOT be shared with the presenter. You will need to capture the information yourself. Do you offer attendee lists? If so, how can I get an attendee list? Yes, the 2019 Philly Post-Show List will be available a few weeks after the conference. Contact Susan Clubb after the conference for an order form. The list rents (which means it may only be used one time) for $450 and includes name, title, school district, snail mail, EMAIL, fax, and district size. It does not include phone numbers. There will be about 4,000 names on the list as over 1,000 attendees OPT OUT of having their information released to exhibitors. My neighbor is blocking my sight lines/being too noisy - what can I do? Contact Susan or John - SClubb@NSBA.org/ JCesaretti@NSBA.org - and we will stop by to check it out. We will be quite discreet and your neighbor will never know that you pointed it out. May I leave early? Booth staff may leave early BUT you may not break down your booth early. If you have to leave early on Sunday, then you MUST have made arrangements for FREEMAN to break down your booth after 4:01. You may not even begin to dismantle your booth BEFORE 4:01pm on Sunday. Dismantling means - to start packing your boxes, to work with a tape gun, or any other behavior that indicates you are closing up. Can my spouse get a badge? You can register them as booth staff for free if you have space OR pay $75 if you do not.